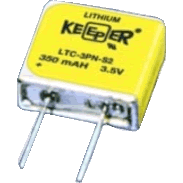 Electric Submeter Battery This is a 1 cell lithium battery designed to work in E-Mon D-Mon Class 2000 KWH demand meter. Low self discharge rate gives this cell a 10 year shelf life. Stable voltage and broad temperature range (-40� to +95�C). High energy, high reliability 3.5 volt power source is an excellent choice for memory backup applications.